Our incubator is full of turkey eggs. There are no broody hens in our laying hen flock right now, so putting eggs under a hen is not an option. The turkey hens don't sit on them either. An incubator with a capacity for 100 eggs costs a couple hundred dollars. For more than that it is even more, jumps up to a thousand dollars quite quickly. The question is asked...what does it do? How does it function? Enter our beat up coolers, that have really seen their last season of use. Because the eggs need to be flipped on a regular basis, a wire rack is devised to hold them together so that the entire thing is turned, not one egg at a time. 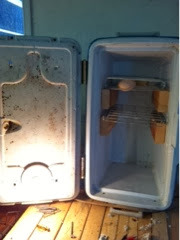 The insulation keeps it warm, so that a lightbulb works set the temperature. Holes drilled to move heat and keep air flowing. Instant read thermometer to keep an eye on the temperature without opening and closing the box. 99.something is the desired temperature. A few adjustments to the bulb wattage, size of holes and all is well. Water in the bottom for the humidity needed by incubating eggs. Now in a month we see what happens.